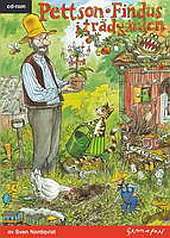 In this educational game for ages seven to twelve, you are Findus, the cat, who promises to look after Pettson's garden, but does not have any tools. You walk around and play games to train your language skills, math skills and reflexes. After each successful game, you receive an object. The aim of the game is to collect tools and free the gardener who is locked up in "Joke world" under Pettson's house. The game has a humourous tone and all drawings are done by Sven Nordqvist based on his popular Swedish kids books. Each minigame trains a skill and has various difficulties for each child.